“Battle of the Pyrenees” was the name given by the British secret agents of MI-9 to the evasions from Europe to Great Britain, through the Pyrenees. After the war, these networks and its members were recognized by the British and Belgian governments and these secret agents have written their memoirs only very recently. The important work done by the intelligence and evasion networks was hidden during the years. 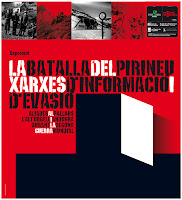 The Ecomuseu de les valls d’Àneu shows, with this exhibition, the importance of these events in the Pyrenees. During the worst years of Franco’s dictatorship, with murders, tortures and illegal imprisonments, some Pyrenean inhabitants fought beside the allies, being couriers and evasion helpers. When the Second World War finished, democracy didn’t come to Spain and even now some Catalan helpers ask if they will be imprisoned for their activities during the war, 60 years ago. The exhibition shows several unknown stories. Our protagonists are: Joan, Jaume and Ricardo Soldevila (Escart, Catalonia); Generosa Cortina (Son); Roger Rieu (Couflens, France); Manel Vidal (Isil, Catalonia); Laurentí Parramon (Josa de Cadí, Catalonia); Joaquim Baldrich (Escaldes, Andorra) and Joan Català (Llavorsí). They worked for the intelligence and evasion networks from Belgium, Great Britain and the United States. Our researchers are Annie Rieu, Josep Calvet, Clara Arbués, Claude Benet and Noemí Riudor. All the information found over the last few months is more than we can use in this exhibition, so the research team have decided to do a book where you can find the whole story. Photography: Soldevilas family, Vidals family, Rieu-Mias family, Parramons family, Joan Català, Joaquim Baldrich, Centre d’Estudis Josep Ester Borràs from Berga, Arxiu Nacional d’Andorra, Musée Départemental de la Résistance et la Déportation de Toulouse, Noemí Riudor, Annie Rieu-Mias, Iberns family. Special thanks to: Joan Soldevila, Joaquim Baldrich, Joan Català, Julien Soldevila, Soldevilas family, Vidals family, Rieu-Mias family, Parramons family, Annie Rieu-Mias, Guillaume Agulló (Musée Départemental de la Résistance et la Déportation de Toulouse), Emmanuel Debruyne (Centre d’Études et de Documentation Guerre et Sociétés from Brussels), Xavier Muntanyà, Jordi Abella, Ester Sánchez, Víctor Rey, Scott Goodall (Association Le Chemin de la Liberté), Marta Giráldez, Jean Feutray, Cristina Simó, Ramon Berga, Xavier Eritja, Lídia Cardona, Rosa Florensa, Anna Tarrado, Phelin Leahy, Llum Divina Ibern, Iberns family, Rosa Manau i Parramon, Campmajós family.